Pants are a drag. Yeah, we said it. Having to not only put on pants at the beginning of the day but, gasp, wear them all day too? Inconceivable. That’s why we’re rightfully picky when it comes to pants shopping. We only want the very best pairs out there – ones that we actually don’t want to take off at the end of the day. Like these Nikes! The Nike Gym Vintage Capri Pants are so comfortable, we think we’d mistake them for high-end pajamas if we had our eyes closed. With a modern fit and vintage details, these joggers are sure to last through decades of ever-changing trends! See it: Get the Nike Gym Vintage Capri Pants for just $45 at Macy’s! Shoppers are loving how these “amazingly soft, comfortable and flattering” capris are suitable for even hot weather. One noted how they don’t “itch or chafe,” while another applauded the fact that they’re not made of too-tight spandex like most other workout pants out there. People are finding every excuse to wear these capris. One said they wear them for working out, while another loves them for lounging around the house or yard. Someone even admitted to wearing them for business-casual days at the office! That’s how cute they are. These “super-soft” joggers are made of a blended cotton fabric, with two yarns interwoven for a heathered look. They have a slim fit, but not a skinny one! They’re just right. They also have a mid-rise waist so we don’t have to worry about pulling up our pants when killing it on the treadmill or attempting to balance in Tree Pose on our yoga mat! These lightweight pull-on pants have an elastic waistband with a drawstring on the outside for an adjustable fit (and a cute accent!). All the way down the leg, we’ll also find elastic at the ribbed, stay-in-place cuffs that are cropped just above the ankle. Back up the leg, we’ll not only find a Nike logo and the famous “Just Do It” slogan at the left hip, but spacious pockets, too! These capri joggers are currently available in six colors. To keep it classic, we can choose Black or Carbon Heather, which we can wear all throughout the year with pretty much anything on top. The more colorful options, however, are super beautiful and need to be seen! Indigo Force is bold, taking on the blue color of the sky at twilight. Indigo Storm, on the other hand, explores the lighter side of the shade, finding purple hues to play with. Speaking of purple, there’s also True Berry, which may be the exact shade of the juice from a blueberry. Lastly is Pink Foam, a hazy bubblegum color that is so, so much cuter than our dingy old sweatpants! We can easily style these capris with athletic sneakers, a sports bra and a cropped tee or hoodie, but we shouldn’t limit ourselves to solely athletic wear! These pants would also look adorable with wedged shoes or a fitted camisole. Or both together, of course! The more excuses and reasons we can find to wear these cozy pants, the better, because we never want them to be too far away from our outfit of the day! Not your style? 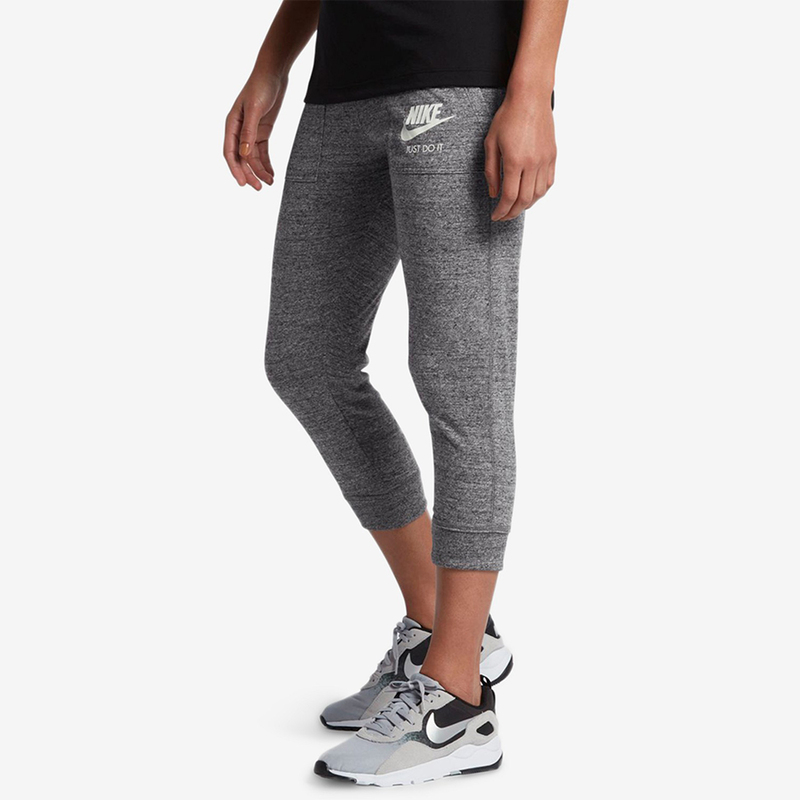 Check out more Nike pieces here and other pants and capris available at Macy’s here!